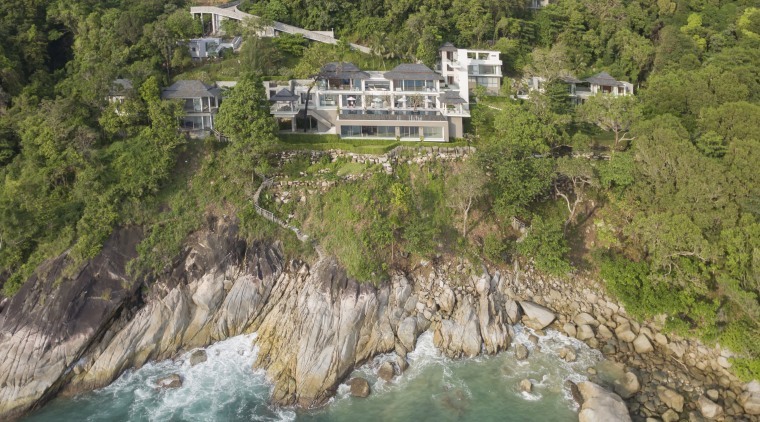 A steep drive leads down to this coastal villas central arrival pavilion, positioned between the two-storey living pavilions on the sides. The master bedroom pavilions are on the right, away from the living areas, while guests are housed in a two-storey structure to the left. Some sites present so many challenges that it's a wonder that anything gets built on them at all. But, paradoxically, the restrictions that a site presents can also pinpoint the design solutions that make building possible. 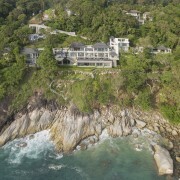 "It sits in a bowl shape facing due west out to the Andaman Sea, so it's very dramatic," says Coyne. "While that gives you beautiful, controlled views, the slope made it technically very challenging to get down and place a substantial villa on it." 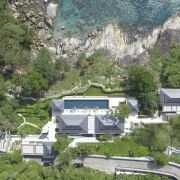 Coyne says that in terms of positioning the house on the site there was a natural point at which the accessway came to an end, at an enormous rock that would have been impossible to get beyond. "So this established an arrival level with an entry point into the back of the house," he says. 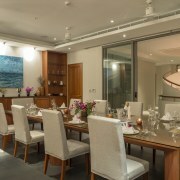 "In a way, the site then drove the design, in that everything needed to be single loaded and front facing. Located in front of the living and dining areas of this coastal villa, the 30m-long pool includes an infinity edge, creating a visual connection to the sea views beyond. 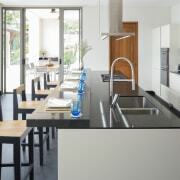 "That made it very easy for us on the one hand, but then the challenge was how to organise the house working with the contours of the site and the gradient." The solution was to spread the villa out horizontally along the contours, with the main two-storey structure consisting of a central circulation pavilion containing a grand spiral staircase, flanked by two pavilions containing the living areas. Bedrooms are accommodated in separate pavilions on both sides of the main villa structure one containing the master suite and the other for guest rooms. A 30m infinity edge pool sits in front of the lower level of the living pavilions acting as the focal point for outdoor living. 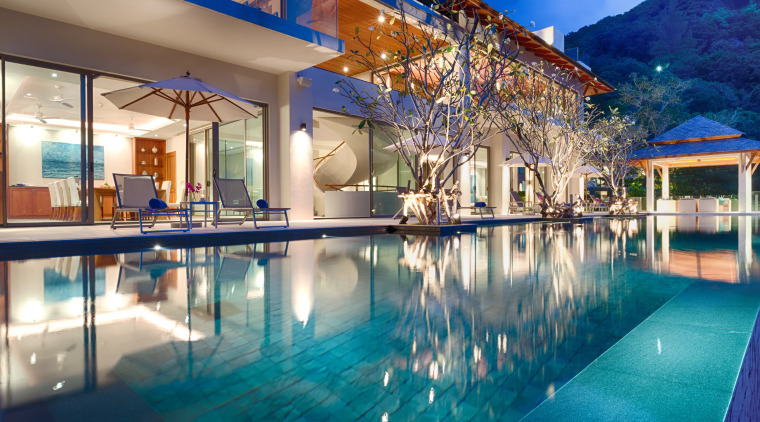 "In some ways the pool is an enormous anchor. It sits there very solidly, almost acting as a bookend holding everything behind it." The architecture of the pavilions is a fusion of contemporary and traditional elements. Coyne says the owner wanted something that looked classic not something that would be a victim of fashion or of a specific time. "But it also couldn't be overly conservative," he says. "So while the overall structure is contemporary, we've used a traditional Thai peaked roof structure on the pavilions. 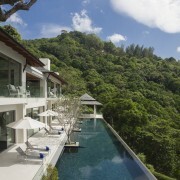 "At a total size of 3500m², this is obviously not a typical Asian home. But emphasising the pavilions with this roof design gives a sense of breaking the structure up into a series of smaller buildings, which is more appropriate for something that's essentially domestic." 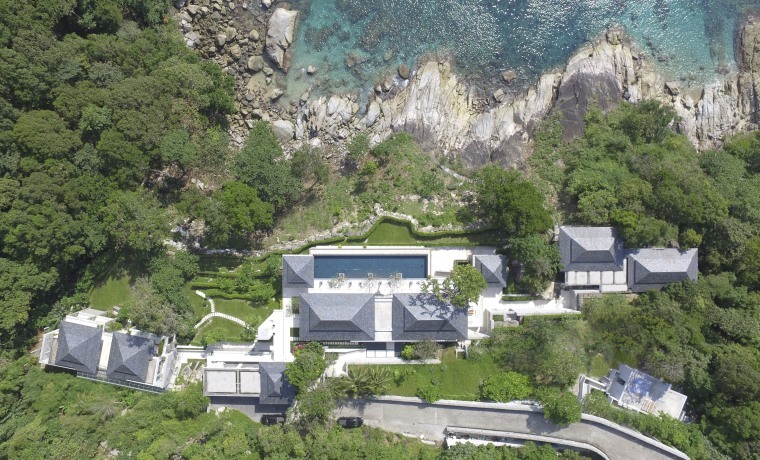 This extensive villa includes a clifftop frontage with views out to Thailands Andaman Sea. The property spreads across the natural contours of the land, resulting in minimal effect on the site and vegetation during construction. The two-storey living pavilions allow for formal spaces on the upper level, with more informal, family spaces on the lower, pool level, while underneath the pool is a recreation area containing a family room, pool table, bar and multimedia room. Traditional touches are also seen in the interior aesthetics, particularly in the formal reception room/library, where the slate peaked roof creates a teak-lined cathedral ceiling. 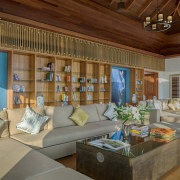 The simple palette of materials also includes teak for the floor and bookshelves. Fretwork above these shelves also follows a traditional Thai pattern, but here it's used to screen air conditioning services. "However, all the glazing slides away and pockets, plus there are ceiling fans, so it's possible to live al fresco. The air conditioning is there as a back-up if needed." Looking back on the 11 years Coyne was involved from start to finish on the project, he says its success lies in the owner's vision and passion, together with a shared belief that the design was right for the land. "If you look at the initial sketch and the final villa, they're not far apart. Your first response when you look at the land is often the best one, because its not compromised by cost, code or a client's changes."